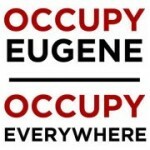 The GA will happen right after Max Rameau’s media stops at Kesey Square and Bank of America protest. We’ll begin at 5:15 this Friday and end at 6:15 so people can carpool to the LCC Peace Symposium panel on “The State of the National and International Democracy Movements”. Join us! Brief speech and comments to media. ~4:45p – 5:15p: Bank of America Protest , 11th Ave. & Pearl St.